Finding solutions for worldwide shortages propels new University of Notre Dame biology professor Jason Rohr to find unique ways to research some of the most pressing issues. These include food shortages. Energy shortages. Even “shortages” of amphibians because of disease. 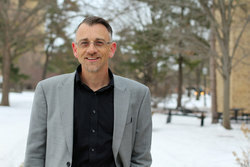 Rohr, the Ludmilla F., Stephen J., and Robert T. Galla College Professor of Biological Sciences, completes research in areas that span the intersection of wildlife and human health. 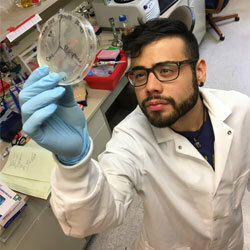 New research from the University of Notre Dame suggests that structures released by the infected cells may be used in tandem with antibiotics to boost the body’s immune system, helping fight off the disease. New research from Notre Dame could lead to regenerative therapies for people with injuries to their brachial plexus, a group of nerves that starts at the spinal cord and goes into the arm. Siyuan Zhang, the Dee Associate Professor of Biological Sciences who is also affiliated with the Harper Cancer Research Institute, landed a nearly $1.1 million Breast Cancer Research Program Breakthrough Award through the Department of Defense in August. Xin Lu, the John M. and Mary Jo Boler Assistant Professor of biology, was awarded a 2018 Susan G. Komen research grant to identify potential new therapies for treating metastatic breast cancer.